3 WHAT IS ANTIFREEZE COOLANT/WHY IS IT NEEDED? 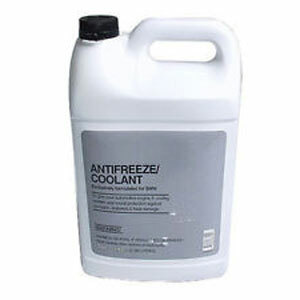 4 WHAT IS ANTIFREEZE COOLANT MADE FROM? 5 HOW DO I KNOW WHAT TYPE OF ANTIFREEZE COOLANT IS IN MY CAR? I don’t mean to be critical but sometimes I don’t understand people when it comes to doing what I consider to be routine vehicle maintenance. Take for instance my neighbor; after he finished changing his oil a few months ago he topped off the other fluids. This is smart except for one thing. Winter was just around the corner and he only added water to his radiator and his windshield washer fluid reservoir. That is a recipe for disaster if the weather gets cold enough. What should he have done? The answer to that is put approved windshield washer fluid in the reservoir for that and only use the best antifreeze possible in his cooling system. Why should you only put antifreeze in your vehicles cooling system? There are many reasons. The most important of which is that it lowers the temperature your coolant in your engine will freeze it. This is especially important if you live in a place that experiences below freezing temperatures in the winter. That is why in this article we will give you pointers on how to select the proper antifreeze for your vehicle and antifreeze reviews what we feel are some of the top rated products in the auto marketplace. BMW not only makes great cars but they have shown here they can make great support products for them too. This is excellent antifreeze that can be used in any vehicle or a number of other purposes where antifreeze is called for too. This product is specifically made to meet BMW’s strict cooling requirements. It might be overkill for the price but it’s one way you can rest assured you are taking care of your BMW or other high-end vehicles the right way. One thing that jumped out at us right away is the price of this antifreeze. You may be able to find a comparable quality of antifreeze for less. It may be nitpicky but the container was hard to open and did not seal well. 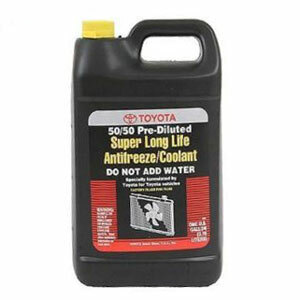 This is not only a good coolant that Toyota makes but it also fills the requirements of using an OEM product in your Toyota car, truck or SUV. The nice thing about it is that you don’t necessarily have to own a Toyota vehicle to get the benefits that this antifreeze offers those that use it. It comes pre-diluted from the factory and has a distinct pink color to identify it as an original Toyota product. Toyota fluids are well-known because they work well and last a long time in your engine. We like the fact that it is made by Toyota itself. That means this antifreeze is specially formatted to meet Toyotas exacting standards for their vehicles. 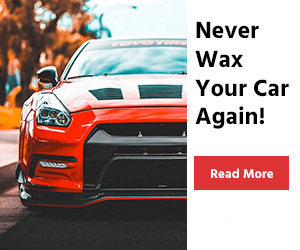 Even if it is no different than some other antifreeze products formulation it will still give you a great piece of mind if you are a Toyota owner. Be careful because this product is only made to be used in cars that are 2005 models or later. 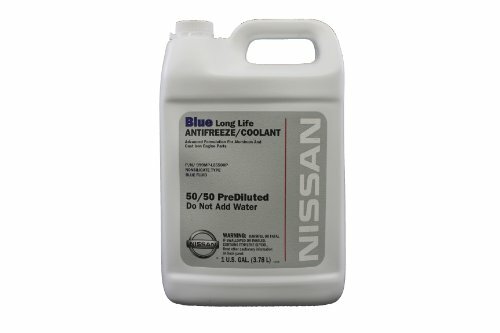 This neat blue antifreeze from Honda will work great in just about any Honda car and many other Japanese imports. It is conveniently pre-mixed with distilled mineral water so there is no extra hassle before putting it into your vehicles cooling system. We really like the fact that this is made to meet all the specifications for antifreeze that goes into any Honda vehicle. 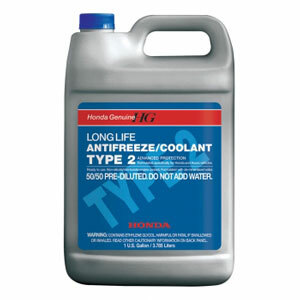 It is said this antifreeze will last up to 5 years in a Honda vehicle without failing. We mentioned earlier that some antifreeze products are not recommended for Japanese built cars so this eliminates that worry too. This coolant is pre-diluted so that means it is a product that is very pricey. With that being said, it is considered a Honda OEM part so maybe it’s better to spend the money and not take chances. 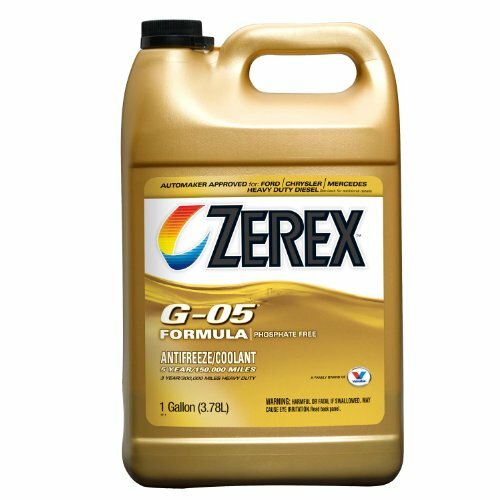 It’s surprising that the Zerex company name is not as well-known as other brands such as Prestone because it is as good as or better than just about any antifreeze in the auto marketplace. This antifreeze does not break down much over time and offers excellent protection to your vehicle’s engine even under extreme conditions. This is a great coolant and we really like the fact that it can be used in both gasoline and diesel engines; that is a sign of a good product. It also has a high-quality defoamer added right into its chemical formula also. This is truly good antifreeze that will work well in most cars and trucks but some people complain that it can be hard to find. It also is a little bit to the pricey side we feel and you may be able to find comparable antifreeze for less. There is a lot to like about this antifreeze. Not only how well it works but the fact that it’s safe antifreeze to handle and accidentally ingest in small amounts. It works so well that it is the product of choice for many of road racing teams. It may just be the top antifreeze product on our review list. We love this environmentally friendly and somewhat pet and people friendly product. It is non-toxic, phosphate free and will do a great job of protecting your engine under extreme hot and cold conditions. There were two things that did not sit well with us regarding this product. One of them was that the container was only a half-gallon size and the other was its extremely pricey antifreeze given that fact. Mercedes comes with a great product for its cars that will not only cool the engine system but also protect it from low temperatures. Also, it is compatible with all Mercedes’ motors no matter whether they are in cars, motorcycles or marine crafts. There are some aspects that confirmed our good impression of this product. First, we really liked the fact that this blue liquid serves both as a coolant and antifreeze. Second, this OEM formula is designed to protect the aluminum parts in the engine system as well as to minimize the possibility of the radiator and engine corrosion. And finally, this Mercedes multi-purpose product works well with cars manufactured before 2014. Except for the price that goes a little bit over the budget for 1 gallon, this product does not seem very convenient when it comes to pouring it into your vehicle. The reason for this is that you will have to dilute it first with distilled water before putting it into use. Also, if your Mercedes car runs on diesel, then you may need specific coolant different from this one. 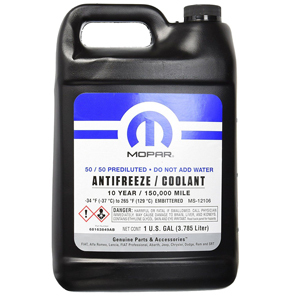 Widely-known for its car parts and accessories, Mopar is here with its 1G coolant, compatible for all Chrysler, Dodge, Jeep, Ram and FIAT vehicle owners. This purple liquid is also a labor-saving product as it does not require dilution. This OAT coolant is surely the perfect choice for the car parts in your cooling system because it has the right properties to provide protection against corrosion. And after this, more or less scientific explanation, we will give you another good reason why this product has caught our fancy. Apart from the fact that you will get rid of the fuss over diluting the coolant, the product will match all of the car brands’ coolant reservoirs listed above. There are a few things, however, that bothered us a bit. You might be misled by the OAT abbreviation because it stands for Organic Acid Technology as written on the product’s label and at the same time some car manuals may indicate that you need OAT with the definition of Organic Additive Technology. And if you are not aware of these terms, you will surely get totally confused, because they both stand for the same thing. Maybe you are one of those Ford vehicle owners that don’t trust putting anything on or in your vehicle that is not an OEM approved part? 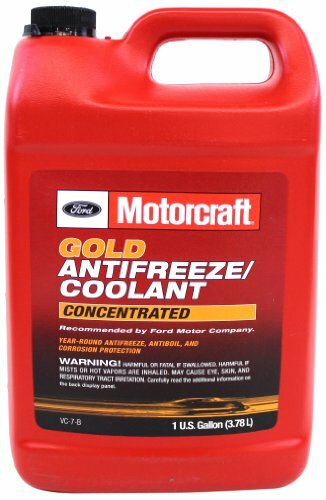 If that is the case then you will love this great antifreeze that is manufactured to work great in all Ford vehicles. It offers better than normal hot and cold weather coolant system protection. We liked the fact that this is premixed so you don’t have to go through the trouble of buying distilled water and thinning it out in another container. Kids are attracted to antifreeze because it looks like juice but this one has a bittering additive that would discourage any child from drinking enough to hurt them. This is a pretty high price tag to pay for pre-mixed antifreeze even if it is an OEM recommended antifreeze. You can probably see a general theme by now in our reviews and that is antifreeze products that are also considered OEM products might very well be the preferred way to go. Here is another good one that is made by Nissan to meet the specific needs of their vehicles cooling systems. This comes pre-mixed so there is no fuss with having to mix it up yourself. It also has an excellent range of advanced engine cooling and keeping that same engine from freezing up in the colder months too. It’s true there is a lot to like about this antifreeze but in truth, there is also nothing that greatly separates it from other brands either. So if you are not buying it as an OEM product you can probably find a cheaper brand that will work just as well. If you are looking for a product that does not cost much for 1G and has excellent quality characteristics, then Havoline is definitely your brand. This pre-mixed antifreeze is manufactured in the USA for the domestic market but is also suitable for all European and Asian cars as well as light duty trucks. You will find this orange antifreeze especially effective when it comes down to taking good care of your car. 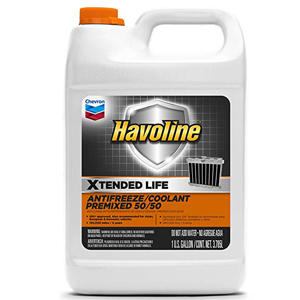 This antifreeze comes with great characteristics which caught our attention. It is OEM approved which means that it fulfills the requirements of GM DEXCOOL. Also, since it is based on aliphatic OAT, not silicate products, you can expect a better performance of the heat transfer. Moreover, the chemical combination of this antifreeze is proved to be perfectly suitable for protecting the water pump seals. As for the corrosion control, Havoline’s product is reliable to keep the metal parts of the cooling system away from such damage. Despite the fact that we are talking about antifreeze, you might get confused to find out that this product may fail to keep your car protected when there are extremely low temperatures outside. This is very good antifreeze that was designed to meet the cooling and antifreeze needs of Audi and BMW vehicles. It not only will protect your car in hot and cold weather but it will also help keep rust out of your engines cooling system. It can be used in other cars besides Audi’s and Volkswagens too. We like the fact that this antifreeze has a formula that is very gentle on engine parts. It is 100% compatible with all the seals and gaskets in your engine. It is also phosphate and nitrate free. This antifreeze does not come pre-mixed so you will have to buy distilled water and mix it yourself which is a little inconvenient. It’s also an antifreeze that does not have a lot of specialty additives so that makes it a little on the pricey side too. You would be hard pressed to find any better antifreeze products in the industry than those made by Prestone. 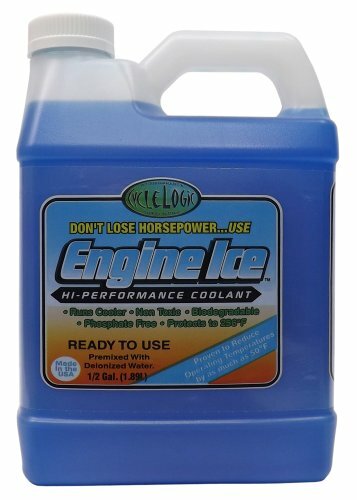 The company name is so strong when it comes to coolant for your vehicle that the name itself is almost synonymous with antifreeze. This is a great product that will do a nice job cooling your engine even under the most extreme conditions. One of the best things about this product is how well it protects your cooling system from corrosion. With its built-in “cor-guard” technology it actually puts a protective layer of coating over you somewhat sensitive cooling system metals to keep them from breaking down under use. This product can only be diluted with distilled water so never mix it with tap water. There are also some who do not believe this product is compatible with all Korean or Japanese import cars. Mercedes-Benz vehicles have just about every component and additive in them specially made just for them. It is a proven recipe for longevity and excellent performance with their vehicles. 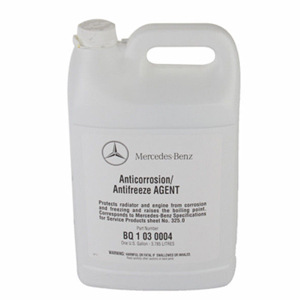 Now if you own one of these vehicles you can put this specialty antifreeze in your Mercedes Benz vehicle too. Mixing it is a little bit of a pain but it does make this antifreeze go a long way. The high and low-end temperatures it works at are pretty impressive; plus 268 degrees Fahrenheit and minus 34 degrees Fahrenheit respectively. This may be a little pricey because after investigating this product further we found out it is made by Zerex. 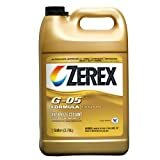 It is still considered an OEM part but Zerex antifreeze is much less expensive than this one. After reading our reviews you have probably gotten a glimpse of the fact that antifreeze shopping is not just as cut and dry as most people think it is. As a matter of fact, if you are trying to find the perfect antifreeze for your vehicle it can actually be a very frustrating and time-consuming process. Most of the Antifreeze products on the list have OEM manufactured recommendations but that also means they can be a little more expensive. There are other brands out there that might be just as effective but also cost less. The problem is how do you know they are just as good as a manufacturer’s brand of antifreeze? It does not seem that there is a lot of direct correlation between price and quality of antifreeze. Most of the more expensive brands are often priced that way because they are made by a major automobile manufacturer specifically for the cars they produce. This antifreeze, while being a very good product, often times has competing products that are very similar in nature and cost less. 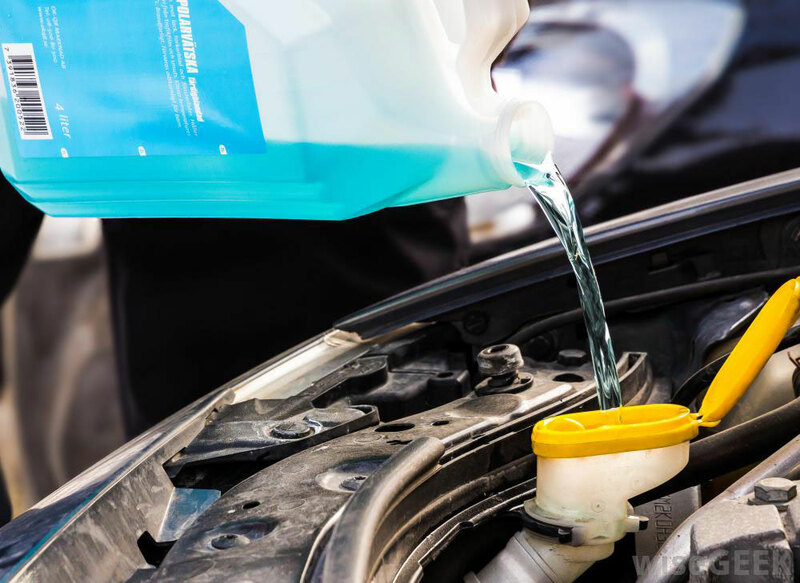 Just like with many products, there are some brands of antifreeze that are much more recognizable than others. Prestone is a good example of this. recognized brands usually have earned that recognition by making excellent products. Antifreeze that has an OEM designation is never a bad choice if it is made by the same company that manufactured your vehicle. You can usually expect to pay a little more for this antifreeze. Many people do not realize there are several different types of antifreeze. They all have slightly different characteristics. Most people don’t realize that antifreeze has changed quite drastically over the years with the biggest improvements being corrosion protection and longevity. This is the generic bright green antifreeze that many people have become familiar with over the years. It is no longer used in new car production because better types of antifreeze are available. You will not find it used in any vehicles that were made after the late 1990s. It contains silicates and phosphates for corrosion control so it is very bad for the environment. Ethylene Glycol is the main component of this mixture. It is antifreeze that is recommended to be flushed and replaced every two years or 30,000 miles. This type of antifreeze can be found in several different colors. It is much better if leaked into the environment because it does not contain any silicates or phosphates. It does still have corrosion inhibitors that are added to it and it lasts much longer that IAT antifreeze products. Many newer types of vehicles are run using this type of antifreeze. Ethylene Glycol is the main component of this mixture. It is antifreeze that is recommended to be flushed and replaced every five years or 150,000 miles. This type of antifreeze is highly recommended to protect aluminum block engines. It is available in several different colors. Unlike OAT type antifreeze it does contain silicates to inhibit corrosion. It features other advanced additives too. Ethylene Glycol is the main component of this mixture. It is also antifreeze that is recommended to be flushed and replaced every five years or 150,000 miles. These types of antifreeze are often used when winterizing such things as drinking water lines but there are some as you can see from our review list that can be used in automobiles. Their main ingredient is a substance that is called propylene glycol which is generally considered safe to consume. This type of antifreeze does not have quite as high a range of cooling and freeze protection as Ethylene Glycol products but it’s still very effective. Another thing that most people do not realize is that several manufacturers color coat their antifreeze too. This is to help eliminate the chance of mixing two different types of antifreeze. Bright Green – this is IAT type of antifreeze that is used on most GM, Ford, and Chrysler vehicles produced in the 90’s or earlier. Antifreeze in most cases can be a very toxic product both if ingested and if it gets into the environment. One of the big problems with antifreeze is that its bright colors remind children of juice so there have been many cases of children accidentally drinking it and getting poisoned. Manufacturers have taken steps to improve safety by adding such things as ingredients that make this fluid taste extremely bitter. So look for these types of things if you have small children at home. Of course, non-toxic antifreeze is the safest of them all. Antifreeze usually comes in two different forms. It’s usually either pre-mixed to the normally recommended 50% antifreeze, 50% water mixture or you have to add water and mix yourself. The premixed version of antifreeze is obviously much simpler to handle. Antifreeze that lasts longer is easier to use also because it does not have to be flushed and changed as often. WHAT IS ANTIFREEZE COOLANT/WHY IS IT NEEDED? Your vehicle works with what is known as an internal combustion engine. In short, this means that a series of small explosions take place in your engine and the force of these explosions creates power which ultimately turns the wheel on your vehicle. The only problem is there is a byproduct of this process and that is heat; enough heat to melt your engine metal parts if it’s not cooled. That is where your vehicles cooling system comes in. there is a water jacket that flows around all the parts of the engine that get extremely hot. This jacket picks up the heat that the engine emits and takes it through your vehicle’s radiator to be air cooled. This process takes place continually as you drive so your vehicle does not overheat. For years water was the only thing that was used in the water jacket of the engine. There were two problems with that. The first is that the engine temperature would get too close to the water boiling point too quickly. The second is that in the winter months the water would freeze and that could ruin the engine too. That is where antifreeze comes into play. It has additives mixed with the water that makes the fluids boiling point much higher than straight water and also lowers its freezing point too. The system is also pressurized which helps also. Without antifreeze, no engine would run very long under extremely hot or extremely cold conditions. Oils we become so thin they would not do their job and once metal starts hitting other unlubricated metal in the combustion process it’s only a matter of time before there will be a catastrophic engine failure in your vehicle. WHAT IS ANTIFREEZE COOLANT MADE FROM? We discussed a little bit about the fact there are different types of antifreeze and although they all do basically the same thing, they don’t all have the same additives in them. Here is an overview of some of the additives that are typically found in antifreeze. Most antifreeze products work best when they go into your engine in a 50/50 mix. That is 50% water and 50% uncut antifreeze. Most manufacturers do not recommend tap water to be used because it has solids and contaminants in it that can cause problems. So most manufacturers recommend you use mineral or purified water in your antifreeze mix. Most people are familiar with the fact that alcohol does not freeze at as low a temperature as water does. That is why it is used as the main ingredient in antifreeze. It takes the freezing point of the water in the antifreeze mix and lowers it significantly. The engine would seize up very easily on a cold day if the Ethylene Glycol was in the mix. Most of these are related to controlling the buildup of corrosion in a vehicle’s cooling system. Some antifreeze mixes do not contain silicates and phosphates and yet others contain varying amounts of the two or even just use one of them. This is the main ingredient being used in what is referred to as non-toxic antifreeze. Huge strides have been made in this area over the years and this type of antifreeze keeps getting better and better at keeping engines cool and keeping them from overheating too. It may not be long before all antifreeze is 100% non-toxic. One thing that was mentioned is companies that produce antifreeze have taken steps to make it safer. Among the biggest concerns is the appealing sweet juice type color that antifreeze has that attracts children. Because of that many companies now have been adding ingredients that make the taste of the antifreeze so bitter that any child would immediately stop drinking it. There are alternate ingredients now being put into the antifreeze mix that is much more environmentally friendly too. 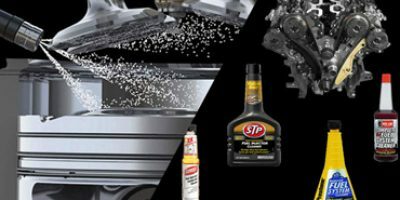 These ingredients are generally used because they have some anti-corrosive properties to them and take the place of harmful phosphates and silicates in the antifreeze formula. That makes the antifreeze that these are used in much more environmentally friendly for disposal and in a case of accidental leakage. HOW DO I KNOW WHAT TYPE OF ANTIFREEZE COOLANT IS IN MY CAR? Many people have the common misconception that they can use just any type of antifreeze in their vehicle. This is simply not the case and mixing different types of antifreeze can actually ruin your engine. 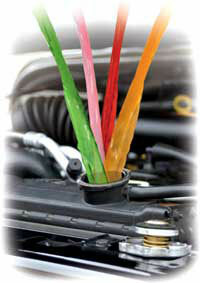 Fortunately, most manufacturers have made the information you need to purchase the right antifreeze readily available. You can find out what type of antifreeze you need just by knowing the make, model and year of your vehicle and its engine displacement. The type of antifreeze you need should also be written in your copy of the owner’s manual and it can sometimes be found on the radiator cap or on a sticker on top of the radiator too. Bright Green – this is IAT type antifreeze that is used on most GM, Ford, and Chrysler vehicles produced in the 90’s or earlier. This is the same chart that was used in the buying guide. The bottom line is, never mix different types of antifreeze together no matter what and always try to use the type of antifreeze the manufacturer recommends. Do you wonder: Does octane booster work? or Should you use fuel injector cleaner? If you did not know already you should now know the important role that antifreeze plays in keeping your vehicle’s engine from overheating and from freezing up in the winter time. Not to mention it helps keep the metal parts in your engine from getting too corroded. That is why you always want to use the best antifreeze you can buy in your vehicles cooling system. There are just so many benefits to doing that. Antifreeze is not an expensive product in general and it is not worth it to try to save a few dollars and risk needing to replace or fix an engine that has badly overheated or seized up; the cost alone for this repair could exceed the value of the vehicle in some cases. The key is properly matching your car to either an OEM type antifreeze product or cross-referencing it and finding another product that has similar characteristics to the OEM antifreeze and is also approved for use in your particular vehicle. Use the buying guide we provide for you in the antifreeze reviews as a reference when shopping and remember you can never go wrong using one of the antifreeze products as long as it’s approved for use in your particular vehicle.